Cousine Island has four elegantly designed French colonial Luxury Villas and one stately Presidential Villa nestled in lush endemic vegetation, just 30 meters from the beach. To ensure the highest levels of privacy and that human impact is kept to a minimum, Cousine Island has four elegantly designed French colonial Luxury Villas and one stately Presidential Villa nestled in lush endemic vegetation, just 30 meters from the beach. Each villa has been uniquely furnished with individually hand-crafted furniture as well as the latest technology to ensure opulence and comfort of the highest level. All villas are in full view of the ocean and overlook Cousine Island’s sugar white beach offering a front & rear veranda and each with its own private swimming pool and outside showers. All villas offer spacious bathrooms with twin showers, twin vanities and Jacuzzi baths. The Presidential Villa is unique and offers a second master bedroom and ensuite bathroom, study area, spa, gym and private outside bar. The Presidential Villa further boasts a full time butler and offers onsite accommodation for a private au pair or chamber lady. The Pavilion’s French colonial design evokes memories of Seychelles past and sets a romantic ambience overlooking breath-taking views of the turquoise ocean and lush green neighbouring islands. The Pavilion offers a boutique, private library, bar, fresh water pool and open air dining and lounge areas. Nestled in lush endemic vegetation, just 30 metres from Cousine Island’s sugar white beach, the stately Presidential Villa is perfectly suited for families and can accommodate a maximum of 4 adult and 2 children. The Presidential Villa is lavishly designed and furnished and offers maximum privacy, 2 master bedrooms with grandiose en-suite bathrooms, a private outside bar area, private gym, spa, study area as well as onsite accommodation for a client’s private staff. The four French colonial Luxury Villas with full sea view and just steps away from the pristine shore of Cousine Island. Each Villa is privately situated and secluded, each uniquely furnished with individually handcrafted furniture as well as the latest technology to ensure opulence and comfort of the highest level. The air-conditioned villas boast private infinity pools, spacious en-suite bathrooms with twin showers, vanities and Jacuzzi baths, a front and rear veranda with 2 outside showers as well as a TV and dining room. The expansive bedrooms open directly onto the beach offering magical views as the sun rises and sets and accommodates a maximum capacity of 2 adults and 1 child. Luxurious Ligne St Barth products with exotic tropical scents are specially selected for each villa to allow guests to relax and indulge, while candlelight ensures a longed for occasion. The lounge and dining area give the ultimate luxury and comfort sure to impress the most discerning of luxury travellers. The Pavilion is the social centre of the island and offers a boutique, private library, bar, fresh water pool and open air dining and lounge areas. Guests are also welcome to enjoy fresh fruit juices and refreshing cocktails at the Gecko Bar or relax in the library with a selection of reference books, DVDs, Videos and CDs and a dedicated broadband connection. The Pavilion is open for guests to use day and evening. On Cousine Island there is no menu, the chef tailors each meal to ensure guest satisfaction, personal attention and preferences. Meals can be enjoyed in the dining area or barefoot on the beach under the starry night sky. The gym room is available for guests to use at any time and the latest equipment including a multi-gym, rowing machine, sit up bench, rowing machine, stairmaster, treadmill, individual weights, gym balls and yoga mats. Relax and unwind in the exotic spa located at the “Original Beach House”. Indulge and spoil yourself with Cousine Island’s exclusive Ligne St Barth product range. Exotic oils and fragrances caress and pamper the senses as Ligne St Barth skin care contains active ingredients of plants, fruits and flowers. Fresh exotic fruit is blended with our high quality elixirs to create intensive, nourishing peeling creams and masks. Luxuriate in fragrances, essences and tropical freshness of a colourful selection of fruits with extracts of pineapple, papaya, melon, passion fruit and mango. From discrete perfumes of pure Bourbon Vanilla to refined lily and the pleasant warmth of shells used during our iconic massage, our exquisite spa treatments will whisk you away on a sensory journey to a world of relaxation, leaving you calm and rejuvenated. Cousine Island is unique amongst the islands in the region as conservation is at the heart of its philosophy. Cousine Island strive to ensure that human impact is kept to a minimum and believe that sustainable ecotourism should involve direct and tangible benefits to the environment. 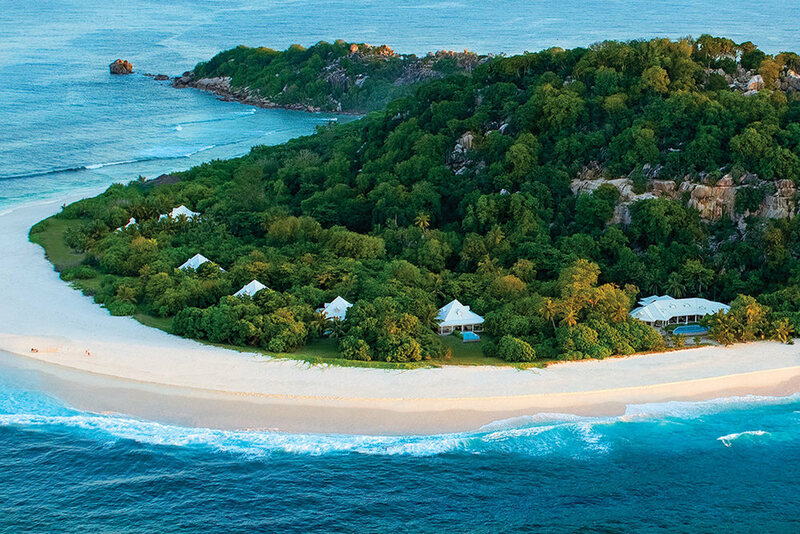 Cousine Island is the first exclusive eco-luxury private island in the world to adopt a conservation based management model in which eco-tourism development ensures that revenue derived from the villas is reinvested for the long term sustainability of conservation. Guests are encouraged to participate in the conservation work on the island, from planting indigenous trees from the nursery, to assisting island ecologists monitor critically endangered marine turtles and birds. The conservation team will take guests on a magnificent journey through the island. Guests always leave Cousine Island with a deeper knowledge of the environment and a sense of belonging to Mother Nature.